The parish dates from 1903. (Mass was once celebrated upstairs in the now demolished school. 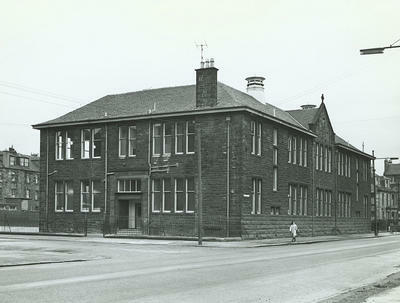 In 1960 Saint Paul's Whiteinch was built on the same site as our old primary school situated on the main road between Glasgow and Dumbarton, in the west end of the city. Its architect was Charles Gray F.R.I.B.A, who designed the church along traditional lines to have a capacity for 600 people. On entering the church the worshiper is at once struck by the intensity of the subdued light which draws their eyes to focus on the jewelled, 162 square metres of curved window, behind the high altar. It is very difficult at first to discriminate the subjects or objects with that initial view but once the eyes have grown accustomed to the light an astonishing amount of detail comes to hand. The panels concentrate on the missionary life of Saint Paul, or Saul of Tarsus as he was first known and are taken from the Acts of the Apostles. It commences with the martyrdom of Stephen, Saul holds the coats, to his conversion on the road to Damascus, his cure and baptism, his escape as Paul, the miracle of the viper, his shipwreck etc. Central to the theme of Paul's life was his preaching of Christ crucified and that his display as the central image of the wall. From Paul's preaching we follow his missionary journey, to Malta, then we see ships, we see the anchors, we see the storm, then his speech before Agrippa. "In a short time you think to make me a Christian", says Agrippa - finally leading us to Paul's martyrdom outside Rome at the Via Ostiensis, where he was beheaded, his head hit the ground three times and according to tradition three fountains immediately came to the surface. To the right of the High altar is the Lady Chapel with its image of Madonna and Child. Again attention has to be given to the hidden detail of the figures which are full of imagery: the cross, the moon, the position of the child Jesus in relation to his mother, the position of the Madonna in the window, the use of colour - deep blue - and the way the the colours are presented. The baptismal chamber can be found on the right hand side of the church, neatly tucked away behind gates. This is probably the most difficult of thecommissions, the glass is set in domed concrete directly above the baptismal font. Central to Baptism is the mystery if the Holy Spirit and this image is displayed as a dove in clear glass. There is no difficulty here in making out what is central to the window and this it is the dove. If you wish to view more of Gabriel's work please right click here and open in a new window.